You will rarely find someone who doesn’t like rich and creamy shahi rabri (shahi rabdi) having nice aromatic flavor of kesar (saffron), and elaichi (cardamom). This recipe uses traditional cooking methodology to prepare nice and thick rabri that has delicious small pieces of solidified milk cream. 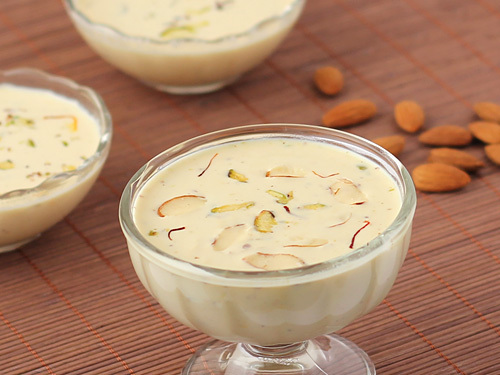 The abundant usage of almonds and pistachio adds to it texture providing something to chew on in every spoon that in turn fills up your mouth with aroma of saffron. 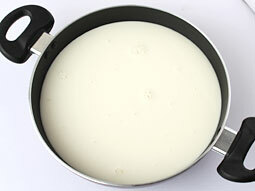 Boil milk in a broad, heavy based, pan or broad non-stick pan over medium flame. When milk starts to boil, reduce flame to low. Stir at regular intervals of 3-4 minutes but not continuously. 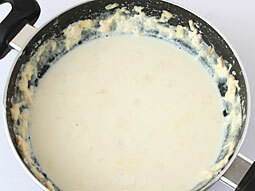 When layer of a cream appears on the surface, shift it towards the side of a pan. Do the same process for next cream layers. Cook until milk is reduced to 1/3 of original quantity. Add sugar and stir to dissolve it. 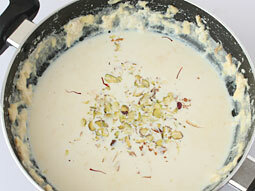 Add cardamom powder, sliced almonds, saffron strands and sliced pistachio; mix well. Scrape small cream chunks collected on the side of pan into milk (this will make delicious small cream chunks in rabdi). Cook for 2 minutes and turn off flame. Let it return to room temperature naturally. Refrigerate it for at least 2 hours before serving. 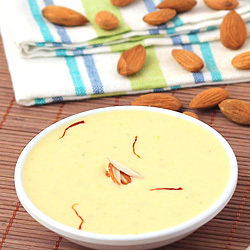 Transfer prepared sweet kesar rabri in serving bowl and garnish with sliced almonds. Serve chilled. Do not stir it too much while cooking otherwise you may not get its signature texture (very small chunks of cream in thickened milk). 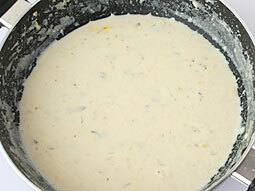 Never use thin-based pan to cook it because milk will stick to the bottom and spoil the taste. Add 1/2 cup ripe mango puree (homemade) in step-5 (before refrigerating) for nice mango flavor. Add small paneer balls (grape sized) in step-4 (before refrigerating) for nice soft and chewy texture. You can make it in lesser time by using readymade sweet condensed milk. However, it will not have texture comparable to one prepared with this recipe. If you are using sweet condensed milk, then reduce the quantity of sugar accordingly. Taste: Sweet, creamy and aromatic with nice texture of small cream pieces. Serving Ideas: This kesar and cardamom flavored shahi rabri can be enjoyed in many ways; either on its own or using it as sub ingredient in Indian sweet dishes like malpua and gulab jamun. Serve malpua or jalebi drenched in thick savory rabdi for an out of the world experience. One question about your recipes; I don't like to eat white sugar which is actually a highly processed food item. Have you tried it with brown sugar or jaggery? If yes, the amount to be used for reasonably sweet taste. By the way, Shakkar and milk is a great combination once you get used to it. Response: Hello Jagdish, I can't give you the answer as I have never tried this recipe with jaggery or brown sugar. I haven't tried any of the dishes but it's so beautifully described that I feel even I can do it. Making these desserts at home will surely be healthier way of enjoying them because we never know how the halwayees make them and what ingredients are used there. I appreciate the effort put by the chef to put the information so lucidly on this site. I am German, living in Hongkong, traveling to India on business and vacation trips. Rabri dessert has always been one of my favorites at the end of an amazing Indian dinner. Thanks for sharing. Now I can make it at home for my boys. All the best to my wonderful Indian friends from amazing India! Lovely website.. easy to understand. Hi, just a week back only I came to know the site.. Interesting recipes and explained very clearly,thank you so much.. I wanna make atta golgappa, please post the recipe for this. Response: Hi Sathyapriya, I have never tried to make pani puri with atta but I will try the recipe and post it. All the recipes are so good and yummy to taste....I really feel proud to be an Indian where out sweets are concerned...I just love all of them especially the ones that have full cream milk..hats off to the older generation who have created this sweet meat tastes for Indians.. Response: Hi Sonia, we will sure upload the healthy recipes for kids. You can try our kids recipes like vegetable paratha, palak paratha, palak pulao, mint pulao, vegetable cutlet and bread cutlet for your kid. I really appreciate your website Foodviva really has very tasty and yummy items. Please introduce some more healthy recipes for kids.. Also recipes for sweets, curries, snacks etc that does not require deep fry and pan fry.. Response: Thanks. We will definitely upload some more healthy food recipes for kids. Should paneer balls be fried, or we should put them as it is. Response: Paneer balls should be cooked (covered) in hot water for 10 minutes (like rasgullas) and then you can add them in rabdi.